The Bonneville Salt Flats is a densely-packed salt pan in northwestern Utah that is a remnant of the Pleistocene Lake Bonneville. 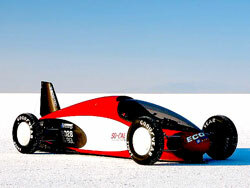 It is the largest of many salt flats located west of the Great Salt Lake, is public land managed by the Bureau of Land Management, and is known for land speed records at the “Bonneville Speedway”. The area was named after Benjamin Bonneville, a U.S. Army officer who explored the Intermountain West in the 1830s. In 1907 Bill Rishel and two local businessmen tested the suitability of the salt for driving on by taking a Pierce Arrow onto the surface of the flats. 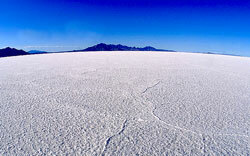 A railway line across the Bonneville Salt Flats was completed in 1910, marking the first permanent crossing.The first land speed record was in 1914 by Teddy Tetzlaff. In August, the Southern California Timing Association and Bonneville Nationals Inc. organize SpeedWeek, the largest meet of the year, which attracts several hundred drivers who compete to set highest speed in a range of categories. In late August, the BUB Motorcycle Speed Trials are held. In September each year is the World of Speed, (similar to Speedweek) organized by the Utah Salt Flats Racing Association. The USFRA also meet on the first Wednesday of each month throughout the summer. In October, the Southern California Timing Association puts on World Finals, a scaled down version of SpeedWeek.